Staff Selection Commission (SSC) will conduct the SSC GD constable recruitment examination in the month of February-March 2019. The admit card for the SSC GD constable recruitment exam, scheduled to be held on February 11, 2019, was uploaded on the official website of SSC on February 4, 2019. The candidates, who have submitted their applications online, for SSC GD 2019 examinations, are advised to visit the official website and download their admit card. SSC Constable GD Admit Card: Staff Selection Commission (SSC) has released the admit card for the Constable (GD) exam. The Commission will recruit Constable (General Duty) in Border Security Force (BSF), Central Industrial Security Force (CISF), Central Reserve Police Force (CRPF), Indo Tibetan Border Police (ITBP), Sashastra Seema Bal (SSB), National Investigation Agency (NIA) and Secretariat Security Force (SSF) and Rifleman (General Duty) in Assam Rifles. So far, the Commission has released admit cards for exam scheduled for March 1 to March 11, 2019. Candidates can download SSC Constable GD admit card 2019 from regional websites of SSC. SSC Constables (GD) in Central Armed Police Forces (CAPFs), NIA & SSF and Rifleman (GD) in Assam Rifles (AR) Examination, 2018 is being held from February 11 to March 11, 2019. The commission will fill tentatively 54,953 (47,307 males and 7646 females) posts through this recruitment process. Close to 55,000 vacancies will be filled through this exam. The Commission will recommend the merit list to Ministry of Home Affairs for final appointment. The exam will be held as per the scheme formulated by the Ministry of Home Affairs and as per the Memorandum of Understanding signed between Ministry of Home Affairs and the Staff Selection Commission. "Final result along with force allocation will be declared by the Commission based on the performance of candidates in the Computer Based Examination. Physical Standard Test, Physical Efficiency Test and Detailed Medical Examination will be of qualifying nature. Staff Selection Commission (SSC) has uploaded the admit card for Additional Candidates for SSC Constable Exam 2019. Candidates who have applied for the exams can download the admit cards from the official website of SSC-- ssc.gov.in. 1. Visit the official website of SSC--ssc.nic.in. 2. Click on the link of SSC GD Constable Admit Card 2018-19. 3. Enter all required credentials and click on the submit button. 4. The admit card will be displayed on the screen. 5. Candidates can download it and take a printout of it for future reference. The third one is the medical test. Candidates will be selected on the basis of Computer Based Test (CBE), Physical Efficiency Test (PET), Physical Standard Test (PST) and Medical Examination. The number of candidates to be shortlisted for PET/PST on the basis of merit in the Computer Based examination will be around 10 times of the number of vacancies. a. Computer Based Examination (CBE): The Computer based examination will have 100 objective questions carrying 100 marks. There will be four sections and each section will have 25 questions carrying 25 marks each. There will be 25 questions on General Intelligence and Reasoning, 25 questions on General Knowledge and General Awareness, 25 questions on Elementary Mathematics and 25 questions on English/ Hindi. Candidates will be given 90 minutes to solve the paper. The questions in all the above components will be of Matriculation level. Total 54,953 vacancies are available for Central Armed Police Forces (CAPFs), NIA and SSF and Rifleman (GD) in Assam Rifles (AR). The written exam for SSC-GD Constable Exam 2018-19 is scheduled to be conducted from February 11, 2019, to March 11, 2019. Candidates are advised to take a printout of the admit card and carry it on the day of examination. The commission will not issue any paper admit card. As per the official notification released on the SSC website, the SSC GD Constable admit card or SSC GD Constable hall ticket can be download online only through the official website. The SSC GD Constable Hall Ticket will be made available on the official website of the SSC only 7 days prior to the actual date of exam. The candidates will be able to download SSC GD Constable admit card online till the scheduled date of examination. Hence, candidates who will appear for the SSC GD Constable should download their admit card before closure date. 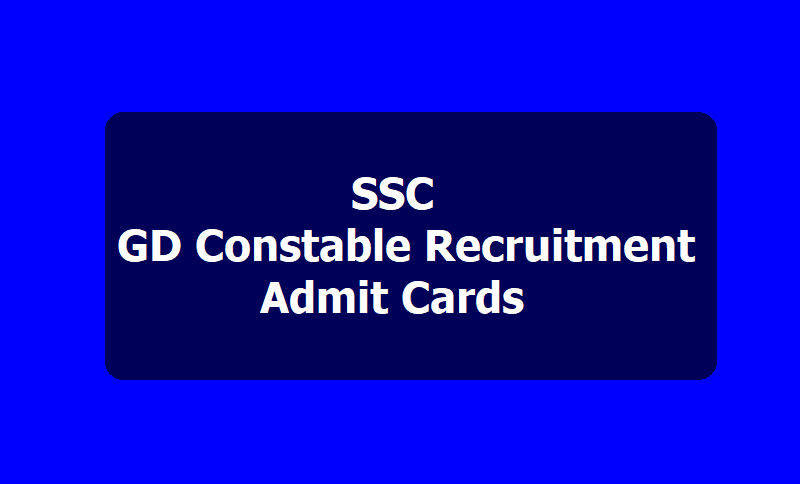 The SSC GD Constable 2019 admit card for February 11 exam was released on February 4 and the download link for the same will be available till the date of examination. The Commission is conducting GD Constable recruitment examination to fill the constable vacancies in Central Armed Police Forces (CAPFs), NIA & SSF and Rifleman (GD) in Assam Rifles (AR). The SSC GD Constable recruitment examinations is being held for a total of 54,953 posts, out of which, - total number of seats for Unreserved category is 32,241; for OBC category - 11,966; for SC category - 9,995; and for ST category - 4,913. Constable (GD) in CAPFs, NIA & SSF and Rifleman (GD) in Assam Rifles Examination 2018: Candidates of Constable (GD) in CAPFs, NIA & SSF and Rifleman (GD) in Assam Rifles Examination-2018 may please note that Admission Certificates(GD Constable Admit Cards) for the above said examination have been uploaded on the websites of the concerned Regional/ Sub-Regional Offices of the Commission. Admission Certificates of a few candidates, whose applications are complete in all respects, have not been generated. Such candidate may please note that status of their city-wise allocation will be uploaded on the websites of concerned Regional Offices of the Commission by 08-02-2019.